Staycations are increasing in popularity, especially among young families. The reasons for this are vast and stem from ease of access to affordability. Staycations are a fantastic alternative to traditional vacations, allowing your family to explore your own community and surrounding areas in more depth than ever before. There are many reasons to take a family fall staycation this year, especially with the weather cooling down and the kids back to school. A staycation is easier to plan than a traditional vacation. Meaning that you can plan a staycation, without needing too much time in advance to do so. Without having to book flights, hotels and attractions, a staycation is a fantastic option for those busy with work, school and extracurriculars. With the cooler weather upon us, some of those activities that can be downright unpleasant during those hot, humid summer months, are much easier to tackle now. The weather will allow for hikes, bike rides and even make wandering around a local fair or theme park a less sweaty experience. There are so many beautiful sights to take in over the fall months. It’s the perfect time to get out there and watch the leaves change colours on the trees, choose a pumpkin from a pumpkin patch or watch wildlife as they prepare for winter. A fall staycation is a budget friendly way to take a vacation without all the added expenses associated with one. Let’s face it, these are the months that we make sure we have saved up for the Holidays, and not many can afford to take a traditional vacation. Take a staycation in order to save money, yet still be able to relax. Taking a fall staycation will give you the opportunity to explore your community and it’s surrounding areas. Giving you the chance to visit fall festivals, pumpkin patches and even community farms that offer corn mazes and more, you will have the chance to explore things you didn’t even know existed in your neck of the woods. 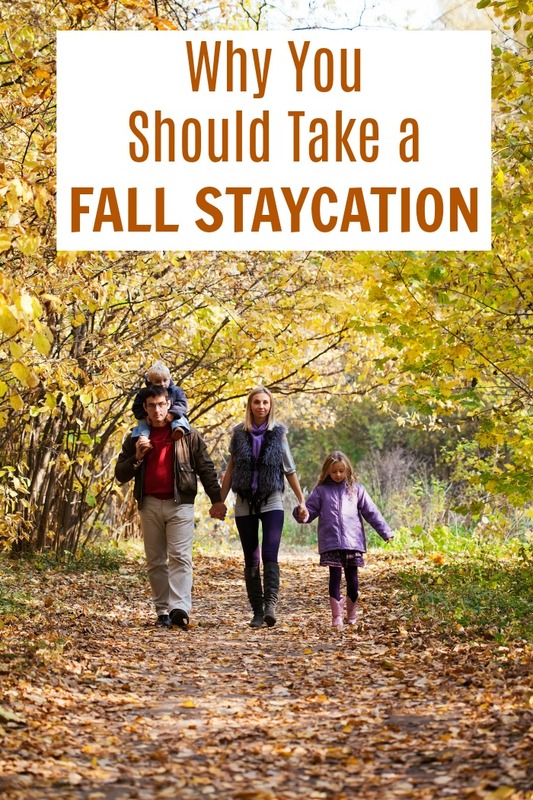 There are several reasons to take a fall staycation with your family this year. Fall staycations are rising in popularity and it’s no wonder why. With so many benefits, and so much fun, a staycation should be on your fall bucket list this year.